The Revolution of 1789 in France is one of the most important events in both French and European history. It marks the rise of the 3rd class after centuries of paying high tax to the King. The revolution centred around (at its peak) the weak King Louis XVI and the immature Queen Marie Antoinette , as the public saw them, and their lavish lifestyle hidden away at Versailles. The people of France at the time of 1789 were being influenced by the media, which did not help the situation. The press would make up stories of their "Wicked Queen's" lavish spending of public money, and her many love affairs which made her extremely unpopular among the French public. The 6 October 1789 marks the start of the Revolution when 100s of market women (and men dressed as women) marched on the Palace Of Versailles demanding the Queen's head and the King's immediate return to Paris. The women were successful in bringing the Royal family back to Paris, even if the queen had not been killed as intended. The situation worsened once in Paris as the "Reign of Terror" came to power, and as Marie Antoinette famously said "Now they will make proper prisoners of us." The Diplomatic Revolution is a term applied to the reversal of long standing diplomatic alliances in the wake of the Peace of Aix-la-Chapelle which concluded the War of the Austrian Succession in 1748. The traditional alliances of France and Prussia against Great Britain and Austria changed to France and Austria against Great Britain and Prussia. In order to cement the alliance, Maria Theresa of Austria married her daughter, Marie Antoinette, to Louis XVI, heir to the French throne. Despite hope that this alliance would create an unbeatable power bloc in Europe, it failed to win the Seven Years' War (fought in Europe from 1758–1763, known in America as the French and Indian War), as both Austria and France failed to stop the rising power of Prussia under Frederick the Great. Furthermore, public opinion on both sides was very sceptical of this alliance, for Austria and France had traditionally been enemies since the Habsburg-Valois wars of the 16th century. The Austrian alliance, including the marriage of Louis XVI and Marie Antoinette is commonly considered one of the central causes of the French Revolution. The Queen was widely condemned for her extravagance, extreme even for a queen, and the most quoted remark never said; when told that the peasants of France were so poor that they could not put bread on the table, she was said to have replied, "let them eat cake," which supposedly "proved" that she was out of touch with the general populace. Although it is unlikely that the queen ever said such a thing, it is still an example of the French citizens' opinion of their royalty, that they would create such a story. As the historian Munro Price suggests, though, much of the criticism of Marie-Antoinette came from the fact that there was no one else to blame for bad policies. Under Louis XIV and Louis XV, both of whom were prolific womanizers who had many official mistresses during their respective reigns, public opinion often leveled the blame for society's ills at the King's current ministers who, more often than not, owed their position to the royal mistress (such as the Duc de Choiseul and Madame de Pompadour in the 1750s). When there was no mistress, however, as was the case with Louis XVI, opinion turned on the Queen, who was widely perceived, and to some extent correctly, to exercise influence with the King in the choice of ministers, as had happened with the intermittent appointments of the Baron de Breteuil (a favorite of the Queen's) to the royal council. Neoclassicism is a genre of art that was prevalent mainly in the 18th and into the early 19th centuries that was based on the Greek style of decoration such as columns. Neoclassical art uses sharp colors as a replacement for more pastel colors. Neoclassicism was influenced by The Enlightenment, which took place in the 17th and 18th centuries, and was the thought of more individualization of the community. It emphasized reason rather than emotion. One of the more popular french artists during neoclassic age was Jacques-Louis David. He was born August 30, 1748 and died on December 29th 1825. He painted the painting call “Tennis Court Oath” in 1792 of the Tennis Court Oath during the French Revolution. During the French Revolution, he became good friends with Maximilien Robespierre, the head of the Committee of Public Safety. Countless ideas from the Enlightenment contributed to the French Revolution. John Locke's ideas of overthrowing government that does not respect the social contract, as well as Rousseau's ideas of the general will and the French government's failure to represent the general will of the people, were major factors. The Enlightenment also stripped away at religion, especially Catholicism, directly attacking the divine right theory that Louis XVI of France used to justify his position. Additionally, massive food shortages were prevalant across France with a constant war, anger over social inequality, and a weak queen and king. Moreover, a harsh winter had resulted in no harvest and the lack of food, especially bread, causing poverty, death, and destruction. The immediate spark of the French Revolution, however, was the financial crisis in France. This problem stemmed from a number of issues. One of the most prominent of these issues was the fact that the nobles were tax-exempt, and the nobles resisted any attempt by Louis to tax them. In addition, France had accrued massive debt from assisting in the American Revolution, as well as from the Seven Years War. Finally, French tax collectors were corrupt. As a result, Louis called the Estates General for assistance and advice to resolve the financial crisis. The Estates General consisted of three estates: the first estate was made up of clergymen, the second estate was made up of nobles, and the third estate was made up of commoners, who represented at least 95% of the populace. The third estate, angry over their disproportionate representation and their inability to act according to their needs, rebelled, and declared itself the National Assembly. Three days later members of the third estate took the Oath of the Tennis Court, swearing allegiance to the French nation and drawing up a list of grievances (cahiers de doléances) against the king. They aimed to democratically represent the will of the people and give the people a constitution, and they were clearly motivated by the Glorious Revolution of 1688 in England. The terrified King Louis XVI, Queen Marie Antoinette their two young children (11 year old Marie Therese and four year old Louis-Charles) and the King's sister, Madam Elizabeth, on the 6th October 1789 were forced back to Paris from Versailles by a mob of market women. In a carriage, they traveled back to Paris surrounded by a mob of people screaming and shouting threats against the King and Queen. The mob of people forced the King And Queen to have their carriage windows wide open. At one point a member of the mob waved the head of a royal guard killed at Versailles in front of the terrified Queen. Despite Marie Antoinette's best efforts to please the mob in giving out bread from the carriage, it was thrown back, as the people refused to eat it as "It is sure to be poisoned." The next four years of the Royal family’s lives were to be of misery and hope although the efforts of Queen Marie Antoinette’s Austrian family, and close friends of the King and Queen such as Count Ferson and Count Mercy, and despite one failed rescue attempt, the royal family were imprisoned. The Royal family saw the terror of the French Revolution, the Queen's nephew by 1792 was now Emperor of Austria and felt no need to rescue his Aunt who he had never met before. In 1792 the crown was abolished in favour of a republic making the now former Royal family of France to be nicknamed “The capets”. Louis Capet, the former King, stood trial in January of 1793 and was found guilty of treason and sentenced to death by Guillotine. An emotional scene followed in which the King said his goodbye to his devastated family. “And you came to France for this!” Louis exclaimed to his wife, Marie Antoinette, dressed in black upon hearing that her husband had been executed from that day on. However more sadness followed when the “Widow Capet” Marie Antoinette’s 8 year old son Louis-Charles was to be taken away. Marie Antoinette leaped into his arms and did not let go for a full hour, despite threats to her life. It was not until they threatened to kill her Marie Therese that she let go. The boy who was hailed as King by Royalist around France and Europe was integrated and turned against his mother. The former Queen was also taken from Madam Elizabeth and her daughter, “Treat her like a second mother” Marie Antoinette told Marie Therese before departing form the tower. As Marie Antoinette was led down form the tower she hit her head on the last pillar of the staircases “Did that hurt Madam?” asked a guard “No I felt nothing” replied the former Queen drenched in black. The widow Capet was taken to a Woman’s Prison. A man waiting a the reception was woken up by a guard (The man had worked at Versailles once as a pastry maker and instantly recognised the former Queen) “Name Please” he asked, Marie Antoinette replied blankly “Look at me”. Deprived of everything the former Queen spend days in her hot cell, reading books, making clothes for her daughter, and playing with a ring on her finger passing it on to finger to finger. Every now and then the Queen would look up when hearing of what sounded like a harp being played, reminding her of distant days long gone. The existence of the Royal family was a weak one of suffering and pain, Marie Antoinette’s sister wrote “Maybe natural death is the best fate” about Marie Antoinette. Finally in October 1793 a full 4 years into the French revolution Antoinette was trialed and found guilty of Treason among other things. She was executed on the 16th October 1793 by Guillotine, Before leaving for her death it was rumoured she said “Now I shall take my place in hell, with my mother and two emperor brothers, and as for my fat pompous of a husband, I want nothing more to do with him”. However Marie Antoinette probably did not say this, just another publicity stunt form the media. Her final words were simply “sorry mousier I did not do it on purpose” after stepping on the executioners foot. Madam Elizabeth followed her brother and sister in law foot steps to the blade a year later. 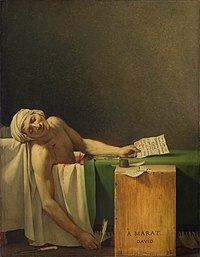 Louis-Charles died alone in his cell in 1795. Marie Therese however out lived the revolution and lived until the 1850s becoming Queen of France for 20 minutes, and holding the title her mother made so iconic “Dauphine of France”. She died in Austria, places of exile (In which she spent most of her life) include, Scotland, Kent and Austria. Returning to France for a brief period of time before being forced to leave by Napoleon who said “She was the only man in her family” when Marie Therese gathered an army and refused to leave France. On July 14, 1789, the revolting Paris mob stormed the Bastille. While only seven prisoners were housed behind its walls, none of whom could be considered political in any way, this event was essential because it symbolized that the people were no longer standing for the power of the nobles and the king, or the rising of the people against the tyranny of absolutism. 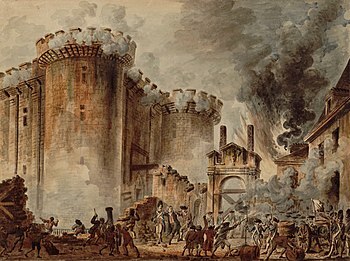 The fall of the Bastille was also the first time, but certainly not the last, during the Revolution that popular mobs would rise up and take action outside of the legislature. These later risings, known in French as journees, would prove to be both extremely influential on public opinion and a cause for major hand-wringing on the part of the legislature, who did not want to risk a massive popular revolution as opposed to the controlled "bourgeois" revolution. The revolutionaries in France established a new government in order to accomplish what they desigred. The members of the National Assembly came from the members of the third estate in the Estates General. These members tended to be from the upper middle class, or bourgeois, and were often referred to as "Jacobins" since they frequently met in Jacobin clubs to discuss the revolution. The lower third estate, or the rest of the citizenry, led the fighting arm of the revolution and the National Assembly at this time. They did not, however, take part in the government. The urban middle class led the storming on the Bastille and the march on Versailles. The National Assembly took a number of actions to remake society. They established social equality, and signed the Declaration of Rights of Man and Citizen, which was a social contract. It provided for freedom of religion, taxation of equality, legal equality, and freedom of press and expression. They wrote a constitution that established a constitutional monarchy with a parliament. The parliament was to be run by the bourgeois, who were considered "active" citizens, while the rest of the citizens were considered "passive" citizens and would not be allowed to take part in government. People in government were to progress based upon merit. Finally, the National Assembly established the Civil Constitution of the Clergy (1790), which clergymen would eventually be required to swear an oath to in 1791. In addition to nationalizing church property, the Civil Constitution also abolished religious vows and turned all Church clerics (including monks and nuns) into civil servants who received their pay and assignments not from Rome, but from Paris. While this was initially well-received by many Frenchmen who applauded the "bringing home" of the church, the subsequent punitive measures taken against clergy who did not swear the oath (also known as the refractory clergy) would be a cause of great resentment in the Western provinces, and was one of the causes behind the Vendee rising in 1793. The provisions of the National Assembly established what was supposed to be a permanent constitutional monarchy, the Legislative Assembly, with Louis XVI as the monarch. However, the Legislative Assembly failed very quickly for a number of reasons. The lower third estate felt abandoned by the bourgeois politically. In addition, the Legislative Assembly failed to fix the food and unemployment problems. As a result, the working men of France, or the sans-culottes, rose against the Legislative Assembly. Emigres, or nobility that had fled France during the Revolution, in Austria wanted the Austrian government to crush the Revolution. Other nations feared revolution in their own countries. Austria signed the Declaration of Pillnitz (1791), which stated that if the other powers attack France, so would Austria. The French interpreted this as a virtual declaration of war. The Brunswick Manifesto (1792) by Prussia stated that the Prussians would punish the citizens of Paris if they did anything to harm Louis XVI or Marie Antionette. Prussia and Austria allied for the balance of power, in order to weaken France. The draining of war on the newly formed government also contributed to its downfall. Anonymous Portrait of Maximilien de Robespierre c. 1793 (Carnavalet Museum). The Convention was an emergency republic with universal male suffrage. The leading body of the Convention was the Committee of Public Safety, who worked to suppress dissent and protect the revolution. The Committee was composed of twelve members, of whom the dominant individual was Maximilien de Robespierre. The leadership of the Convention split into two factions: the Montagnards (or "Mountain"), who was more radical and included Robespierre, and the Girondin, which was more middle class. The Convention had a number of issues to address. First, and perhaps most importantly, they were actively engaged in war with Prussia and Austria. They instituted the first draft, called the levee en masse, and a nationalist feeling rose among troops. In 1794, the French army invaded Austria and was successful. In addition, the Convention needed to remake society. Members instituted "dechristianization," which was essentially the purging of Christians in France. The Convention also needed to address the food problem, and established the "General Maximum" that controlled bread prices and wages. Finally, the Convention needed to stop the counter-revolution and write a new constitution. During a period known as "The Terror," Robespierre and the Committee of Public Safety utilized the newly invented guillotine to execute tens of thousands of counter-revolutionaries. The Convention successfully wrote a new constitution, establishing a government known as the Directory as a permanent republic. On 27 July ("9 Thermidor" in the Revolutionary Calendar) 1794, Robespierre himself was arrested, and was executed the next day. The resulting "Thermidorian Reaction" was a response to France's swing to the left, during which the government briefly went to the right, and finally back to the center. The Jacobins and other Montagnards were replaced with the more moderate Girondins (Bourgeois), and many Montagnard members were executed. The Directory was the first constitutional republic, which had an executive body of five directors, as well as a bicameral legislative body consisting of the Council of Ancients and the Council of 500. In 1797, the first free elections were held, and the people of France astonished members of the Directory by electing a majority of royalists to the legislature. Unwilling to risk the reversal of everything achieved since 1789, left-wing members of the legislature, combined with support from the military, purged the Directory of rightist members in the coup of 18 Fructidor, which established a dictatorship controlled by left-wing Directors. However, people grew fearful of a possible return of the Terror, thus, when Napoleon Bonaparte and Abbe Sieyes launched the coup of 18 Brumaire to end the Directory and instead establish the Consulate, there was little opposition. This page was last edited on 20 October 2017, at 12:43.